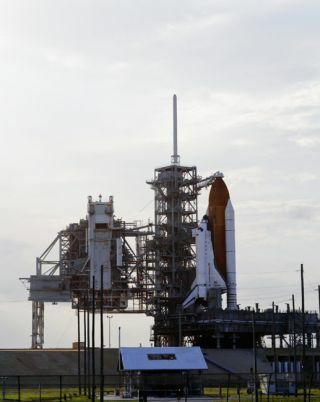 CAPE CANAVERAL, Fla. - After a string of vexing delays, NASAis once more preparing the space shuttle Endeavour for what will be its sixthlaunch attempt late Wednesday. The browbeaten shuttle has been trappedon the ground by a series of weather delays and a gas leak that has sincebeen fixed. NASA is hoping Wednesday will bring a much-needed break in stormyweather and allow Endeavour to lift off at 6:03 p.m. EDT (2203 GMT) from aseaside launch pad here at the Kennedy Space Center. In the meantime, ground crews must replace an unattachedplastic cover on one of the shuttle's 44 small thrusters used for minorcourse corrections. The cover, made of a material called Tyvek, keeps moistureout of the thruster nozzle while the shuttle is on the ground. Without the cap,rainwater could seep into the thruster and freeze, rendering it useless onceEndeavour reaches space. Endeavour's STS-127 mission is a busy construction flight tothe International Space Station. The spaceflyers plan to deliver spare partsand a new exposed science platform for the station's Japanese Kibo laboratory. Endeavour's crew is taking some down time today. Theastronauts plan to spend time with family and friends, and commander MarkPolansky and pilot Doug Hurley are scheduled to practice landing the spaceshuttle by flying modified Gulfstream aircraft. The thruster cover work for Endeavour involves moving thegiant Rotating Service Structure scaffolding into place around the shuttle togain access to the nose, where the exposed thruster is located. Workers willinspect the area for moisture, vacuum any water out if necessary, then reapplythe cover with an adhesive that takes a while to dry. "There is a process so it takes on the order of aboutfour hours to go through and do that," Nickolenko said. "While wehave the Rotating Service Structure around the vehicle, the intention is toreplace all of those Tyvek covers, in essence to reset our clock. We requirethat the covers be replaced after seven days." If Endeavour succeeds in launching Wednesday, its STS-127mission should not be adversely affected. Though some activities will have tobe rearranged to allow for an earlier space station undocking time thanplanned, to make way for the arrival of a Russian unmanned cargo craft, theshuttle mission should not have to give up on any of its goals, shuttle missionmanagement chair Mike Moses said. However, if Endeavour's launch must be pushed to Thursday,the 16-daymission may have to lose at least one spacewalk. "I think that would definitely be our last try,"Moses said. "We want to be smart about it. This is a very complicatedmission, it's very aggressive, very full. And we don't want to just, without alot of forethought, change things up." After Thursday, the next chance for Endeavour to launchcomes July 26. SPACE.com is providing continuous coverage of STS-127with reporter Clara Moskowitz at Cape Canaveral and senior editor Tariq Malikin New York. Click herefor mission updates and SPACE.com's live NASA TV video feed.